No branding. No Sponsors. No BS. Just CASH. Kayak Fisherman, Land based Fisherman, Boat Fisherman, Etc. $4.50 will go to the payout, $4.50 will go to tournament host per entry, & $1 management fee. Payouts will fluctuate a few dollars based on how many anglers are signed up. The numbers and payouts given are based on increments of 25. 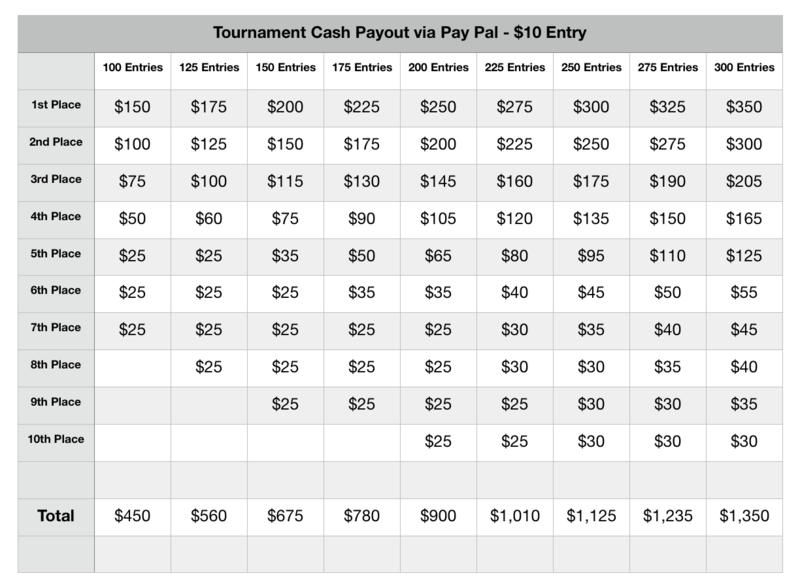 See payout scale. Payments of winning will be the total of the payout minus a 3% transaction fee that we eat upon participant signup. The idea of this tournament is complete transparency. No BS. Step 2 - GET a measuring device. Your fish will be measured in inches, not by weight. There are a bunch of measuring boards available online or at retailers like Walmart. If you don’t have access to one a simple tape measure will do, but place the tape measure towards the bottom or above the bass so that we can easily see your entire measuring tape. We strongly suggest a real measuring device such as a bump board. Step 3 – WRITE down your “Identifier Code.” On the first day of the tournament, you will be able to see your 4 digit code (blue at the top) in your TourneyX app under Identifiers. This code is SUPER important because you need to have this code either written on the back of your hand or on a piece of paper in the picture you take of your fish. This is to make sure that the fish was caught during the official tournament time period. Step 4 – CATCH bass. Any species of black bass qualify (including largemouth, smallmouth, spotted, guadalupe, redeye or shoal). Step 5 – TAKE a picture of your bass with mouth closed on your measuring board with your “Identifier Code” clearly visible. If the coin is not in the photo or not visible and clear, the fish will be disqualified. If the mouth of your bass is even slightly opened, the fish will have half an inch deducted. Step 6 – SUBMIT your catch on the TourneyX app or online at TourneyX.com before the deadline. 1. This is a CPR online bass tournament. Catch, Photo, & Release! 2. All bass entries will be submitted on your TourneyX App. 3. Your rank is based on the top 5 biggest bass you submit. You can submit as many bass as you want up until 11:00 pm on the last day of the tournament. Keep upgrading your fish and the top 5 biggest will be judged. 4. Fish will be measured in terms of inches, not weight. 6. You will need to provide your own measuring device. 7. When the tournament starts at 6:00 AM, TourneyX generates a UNIQUE 4 digit code for each angler. Your “Identifier Code” will be listed under the View Identifier area of your APP or Website dashboard. This code will need to be in every bass picture you submit on the TourneyX app or on the TourneyX.com website. 9. The fish needs to be measured from left to right. Starting from the mouth on the left and ending with the tail on the right. This eliminates people being able to flip the bass around and submit the fish twice. Dorsal fin must be up. Please make sure your fish pictures are clear. Make sure we can see some of the mouth and the beginning of the measuring device. Completely covering the fish face will result in a DQ of the fish. 10. Make sure the mouth on your bass is completely closed. A half inch will be deducted if the mouth is even slightly opened. Note: You can only place first place in 1 out of the 12 tournaments we do this year. NONE. NO SPONSORS. NO BS.